Hmm, as much as I am not a Peyton Manning fan, I think we may have to consider the source of this story … Al Jazeera’s Investigative Unit. But watch the VIDEO below, it is intriguing, but questionable. According to a special report from Al Jazeera’s Investigative Unit via the HUFFPO, NFL Quarterback Peyton Manning,while with the Indianapolis Colts in 2011, received human growth hormone, HGH. The allegation comes in a documentary dubbed ‘The Dark Side,’ in which British hurdler Liam Collins went undercover to expose the widespread nature of performance-enhancing drugs in global sports. An Indianapolis anti-aging clinic supplied quarterback Peyton Manning with human growth hormone, a performance-enhancing drug banned by the NFL, a pharmacist who once worked at the clinic asserts in a new special report from Al Jazeera’s Investigative Unit. The report, “The Dark Side,” is the result of a monthslong investigation in which Liam Collins, a British hurdler, went undercover in an attempt to expose the widespread nature of performance-enhancing drugs in global sports. As a cover story, Collins tells medical professionals tied to the trade of performance-enhancing drugs that he is hoping for one last shot at glory at the 2016 Olympics in Rio de Janeiro, Brazil. 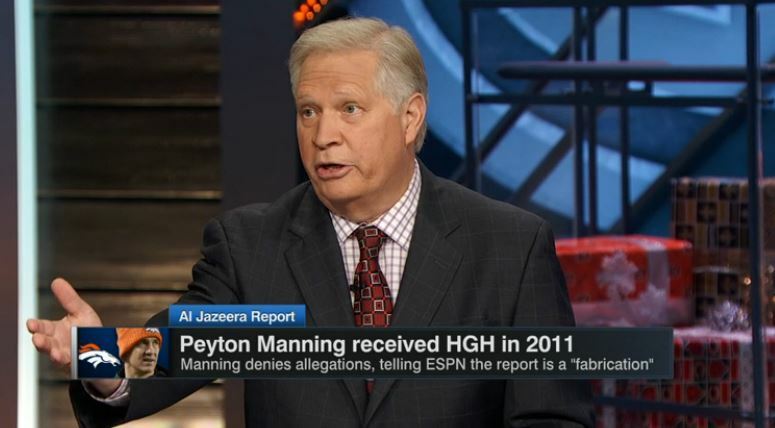 Manning is just one of many high-profile players the report names and raises questions about. As part of the investigation, Collins connected with Charlie Sly, a pharmacist based in Austin, Texas, who worked at the Guyer Institute, the Indiana-based anti-aging clinic, in 2011. Manning missed the 2011 season, when he was a member of the Indianapolis Colts, after undergoing neck surgery. In the documentary, Sly tells Collins, who is taking secret video of his interactions, that he was “part of a medical team that helped [Manning] recover” from the surgery. Sly alleges that the clinic mailed growth hormone and other drugs to Manning’s wife, Ashley Manning, so that the quarterback’s name was never attached to them. Manning and his wife also came to the clinic after its normal business hours for intravenous treatments, Sly tells Collins on the undercover video. UPDATE I: Peyton Manning calls the report BS. Peyton Manning has come out in response to these allegations as said it absolutely never happened. 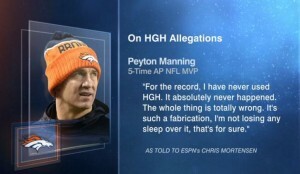 UPDATE II: ESPN – Manning completely denies the allegations. “Knowing Peyton Manning and everything he stands for, the Denver Broncos support him 100 percent,” the team said. “These are false claims made to Al Jazeera, and we don’t believe the report. A-ROD STRIKES OUT … SUSPENDED FOR 2014 BASEBALL SEASON. Arbitrator Fredric Horowitz has handed down his decision and it bans the New York Yankee’s Alex Rodriguez for the entire 2014 MLB season. Horowitz’ ruling actually reduced A-Rod’s suspension from 211 games to 162; however, it is still the longest penalty ever for a drug violation. The 162 game ban plus any post-season games in 2014 of the 14-time All-Star and three-time Most Valuable Player is a 100% endorsement of Major League Baseball’s accusations that Rodriguez scored an array of PEDs from Biogenesis. Alex Rodriguez get hit by pitch by Ryan Dempster of Boston Red Sox at Fenway Park as the crowd boos A-ROD and then cheers after he is hit … A-ROD’s a CHEATER!!! Alex Rodriguez has been suspended for the entire 2014 season by arbitrator Fredric Horowitz, who handed down a 162-game ban to the New York Yankees third baseman for his involvement in Major League Baseball’s Biogenesis scandal. The suspension also includes all potential playoff games in 2014. Horowitz’s ruling upholds a good portion of the original 211-game suspension levied by MLB, which banned Rodriguez in August after concluding its investigation. Rodriguez continued playing after appealing the decision. A-Rod vowing to take the fight to federal court. “The number of games sadly comes as no surprise, as the deck has been stacked against me from day one. This is one man’s decision, that was not put before a fair and impartial jury, does not involve me having failed a single drug test, is at odds with the facts and is inconsistent with the terms of the Joint Drug Agreement and the Basic Agreement, and relies on testimony and documents that would never have been allowed in any court in the United States because they are false and wholly unreliable. UPDATE I: MLB statement on A-Rod arbitration ruling. Welcome back Alex Rodriquez … CHEATER!!! The Chicago White Sox fans booed Alex Rodriquez unmercifully last night in Chicago in his first plate appearance with the Yankees since the MLB suspended him today for 211 games for PED use. Rodriquez said he would appeal the suspension. All I can say is A-ROD thinks he was booed last night, wait until he takes his first at bat back in Yankee Stadium. He is going to hear more than just Bronx cheers. Yankee fans are going to boo him like has not been heard in years. Alex Rodriguez stepped up to the plate greeted by a standing boo-vation and blooped a single in his first at-bat of the season. Hours after Major League Baseball suspended the New York Yankees star through the 2014 season in the Biogenesis drug case, Chicago White Sox fans got their say Monday night. And, boy, did they let him hear it. They jeered him during pregame warmups and introductions, and they really tore into him when he walked to the batter’s box leading off the second inning. Did Baltimore Raven LB Ray Lewis Get Illegal Banned Substances (Deer-Antler Apray with IGF-1) from S.W.A.T.S to Speed Up his Triceps Recovery? With the Super Bowl XLVII only days away along comes the following story to bring some life to media day … Did Baltimore Ravens linebacker Ray Lewis use a banned substance from S.W.A.T.S to speed up his recovery from his triceps injury? According to a Sports Illustrated story, he did. According to the report, Lewis used a deer-antler spray that contained IGF-1, which is on the NFL’s list of banned substances. With so many athletes using PED, it is almost like it is a story and news alert when we learn of one who isn’t using. Defiant denials of the use of PED from athletes mean little today. We have been down that path before. Sports Illustrated has published an in-depth examination of a company called Sports with Alternatives to Steroids (S.W.A.T.S.) and its relationship with high-profile athletes, including Baltimore Ravens linebacker Ray Lewis. S.W.A.T.S. is an edgy sports science company run by a gym owner/former stripper. The company specializes in holographic stickers, deer-antler pills, and other, um, progressive means of enhancing a player’s performance. David Epstein and George Dohrmann write that S.W.A.T.S. owner Mitch Ross recorded a phone conversation with Lewis after the linebacker’s injury in October. As reported at ESPN, Ray Lewis is denying reports that he used PED, performance enhancing drugs. However, in this day and age of sports, one has to wonder who isn’t using them. Although it has been stated that Lewis has never tested positive for a banned substance, one has to ask when was the last time he was tested. One thing is for certain, its a good thing that Ray Lewis is retiring from the NFL. The legs of this story most likely will go away when Lewis does. Although, it will depend on whether he wants to get a TV gig after his career, then the legs of the PED will be back. Ray Lewis was given a product to help heal his torn triceps that contains a banned substance, according to a Sports Illustrated report that will appear on newsstands Monday. The Baltimore Ravens linebacker has not tested positive and denies using it, a team official told ESPN’s Sal Paolantonio. The Ravens had a meeting with Lewis on Tuesday morning to discuss the article. “He denied using the substance discussed in the article, and we believe him,” Byrne told ESPN. Ravens coach John Harbaugh said he has not talked to Lewis about the report.